Is the picture above really a cloud? Honestly, that’s what the U.S. government wants you to believe. A new website is offering searchable access to the files of Project Blue Book – American UFO-hunters whose work has been described as ‘the real X-files’ and who dealt with thousands of pictures of extraterrestrial invaders throughout the 40s, 50s and 60s. The blotchy images and files have been stored on microfilm – but include some truly weird images and accounts of events, such as the 1947 visitation which led to the term ‘flying saucer’ entering the language. There are also hundreds of unsolved mysteries – and others which are dismissed with not-exactly-convincing explanations, such as the idea that the 1951 New Zealand image above is a ‘lenticular cloud’. This has naturally fanned the flames of conspiracy theories that there is a huge cover-up of UFO images, America been in league with aliens for decades, that Nasa has colonies on Mars, and that many, if not all, world leaders are shape-shifting reptiles, etc etc. Other images are simply hilarious, such as what appears to be a submarine flying over the Bronx in 1954 (below). Better still, there are 701 UNSOLVED cases among the files put online by The Black Vault – perfect fuel for tinfoil-hat wearing maniacs and wannabe Mulders and Scullys around the world. Nigel Watson, author of the UFO Investigations Manual says that while the files have been available online for some time, the new, searchable database highlights some intriguing mysteries. ‘Project Blue Book was unable to solve 701 cases so there is plenty of work for amateur investigators to try to come up with explanations they never had time to consider or research. Much of this data was put on microfilm rolls and isn’t the best quality for reading and sometimes the amount of information is provided is quite limited. Not surprisingly most of the reports are of distant objects and lights in the sky. There are no cases of encounters with aliens in these files as they were filed in their trash can! ‘For me the Kenneth Arnold case still remains intriguing even if it does not involve aliens or anything exotic. His sighting hit the headlines and gave us the term ‘flying saucers’ hit the headlines. 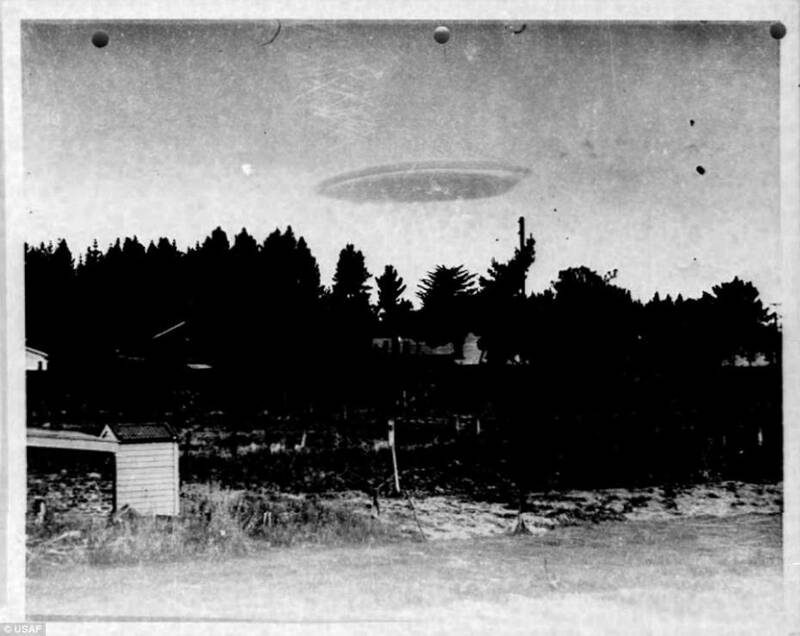 ‘Arnold saw nine UFOs over Mount Rainier, on 24 June 1947. His experience meant that US government agencies took an interest in UFO reports. ‘Whilst flying from Chehalis to Yakima, Washington, he saw a blinding flash of light. Looking around he saw nine very thin half-moon shaped objects moving southwards from Mount Rainier. They flew in a diagonal formation that stretched about five miles from the first to last craft, and they bobbed about erratically. ‘He estimated that they traveled faster than 1,000 miles per hour as they flew from Mount Rainier to Mount Adams. At Yakima he reported his sighting to Al Baxter the General Manager of Central Aircraft. News of his story spread rapidly and when he flew on to Pendleton, Oregon, a group of newspaper reporters were waiting for him. It was here that he described these craft as moving “like a saucer would if you skipped it across the water.” Thereby the term flying saucer came from the description of the movement of the craft rather than their appearance. ‘On 12 July 1947, Arnold was interviewed by special agent Lieutenant Frank M. Brown of A-2, Military Intelligence, Fourth Air Force, who was very impressed by his truthfulness and character. Later, on 25 July, Lt. Brown and Captain William Davidson took Arnold and his wife out to dinner. At this meeting they said they could not explain what he had seen. ‘Explanations from mirages, secret aircraft to the flight of pelicans have all been used to try to explain his sighting but it still remains a mystery.